Recently I was asked by someone who runs youth groups and summer camps about purchasing giant-sized board games. I’ve written about a wall-hanging Scrabble and 9 foot Jenga before but I think he was hoping for something more economical than $12,000. Thus I ended up resorting to some basic internet research, and while I can’t vouch for all the vendors, I thought you might be interested in what I discovered. 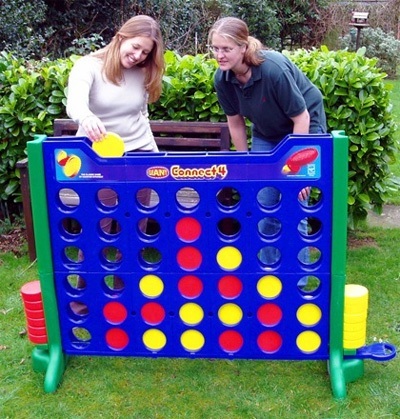 Garden Games of the UK makes a variety of big games, including Connect 4, Chess, Jenga, Snakes & Ladders, Dominoes, and Pick-up Sticks. Local stockists are listed on the company’s website. Lettuce Make Thyme sells some of their products in Canada. In the US, online retailer Gopher offers Giant 4 Up It (Connect 4), Giant Tower (Jenga), and Giant Checkers at prices ranging from $180 to $390. S&S Worldwide has a smaller but still large Giant Four in a Row for $52, as well as Super Tumbling Timbers, a Checkers and Backgammon Game Rug, Jumbo Nutrition Island, Jumbo Chess, Jumbo Word Scramble, Jumbo Tic-Tac-Toe, Jumbo Chinese Checkers, Jumbo Snakes & Ladders, Jumbo Ludo, Super Jumbo Playing Cards, and Gianormous Checkers for anywhere between $12 and $270. On Amazon, a Pressman Giant Garden Chess Set is $47, a Pressman Giant Garden Four In A Row is $40, and Multiflex Jumbo Checker Rug Game is $15. Oversized games are also available on Etsy, where you can get big Scrabble letter tiles in sets of various sizes, a felt Giant Checkers Game With Bag for $70, sets of three custom giant pillow dice for $56, Giant Dominoes individually or in a set, a Huge Tri-Omino Game for $172, a Backyard Block Party Outdoor Game (Jenga) for $78, and a deck of oversized vintage playing cards for $26. Update: Thank you to Labyrinth Games and Puzzles for pointing out the following. Another maker of giant games is Jaques of London, which has British and American versions of its website. Many of the company’s products are available in multiple sizes. For example, the Score 4 (Connect 4 in wood) comes in three sizes at $100-$150. Jaques of London also sells outdoor Backgammon, Ludo, Snakes & Ladders, Chess, Checkers, Pick-up Sticks, and Tic-Tac-Toe. Games for All of Canada sells and rents giant sized games, including Giant Cannonball Drop, Giant Checkers, Giant Chess, Giant Dominoes, Giant Ludo, Giant Snakes and Ladders, Giant Tower, and Giant 4 Up It. That could come in very handy, especially this summer. Check out the Giant Scrabble and Monopoly from Winning Solutions (www.winningsolution.com) They aren’t as big as the above pictured products, but are a nice size for group play. Available in $40 and $120 deluxe versions. Hello, this morning I sent a comment to you about http://www.thegiantgameco.com and their line of giant games for sale and rental. I just looked at the comment section of your story and there is no record of my contribution and was just wondering why you did’nt post the comment. I thank you in advance and look forward to your reply. Patience please. Sometimes, we have other things to do for a couple of hours. What a fantastic resource – giant games are such a great way to encourage team building and engage kids (and adults)! We’ve seen some super creative giant versions of games over the years that fans have created themselves – here’s a great post for inspiration! Great to see you at ASTRA, hope the show was a great success for you! We at Games For All (gamesforall.ca) also sell Giant Games in Canada and we also rent them out! We’re expanding our inventory of giant games daily. Thank you. I’ve added you to the article. http://www.thegiantgameco.com . They are located in New Hampshire and have been offering their products through their website since 2004. That other company is you. Comments from manufacturers and retailers are welcome but please be up front about who you represent. At Twice The Fun Games (twicethefungames.ca) we sell Giant Games in Canada; if you have a special event and only need the game(s) for the day we’ll rent them out! We’ve expanded and continue to expanding our inventory of giant games and are now commissioning Giant Games to be made specifically for us; soon to be added: Nine-Man Morris, Jenga, Scrabble and more. Can I purchase the giant connect 4 game? What is it made of and what are the measurements? We make and sell Giant Jenga and dice at http://www.bigbloxgames.com. My name is Scott Smith and I’m the owner of a party rental company called Scotty’s Jumpnfun Party Rentals here in Rome New York. We specialize in a large variety of inflatable fun. I deal a lot with backyard parties as well as corporate events and I’m looking for a whole new venue for this year with a large variety of party games. Is there anyway you can send me a brochure or call me so we can discuss this matter. I’m on a tight time frame for our 2015 schedule . Anxiously waiting for your reply! There appears to be lots of wood stacking games, but the only genuine big hardwood Jenga brand stacking game is JENGA GIANT. It’s interesting that these companies are using the registered Jenga trademark in their listings, ads, product descriptions, source code, and//or key words to describe and get attention for their large imitations of Jenga. Jenga Giant is huge, can reach over 3 feet high, and is 8 times the weight of standard Jenga. Jenga XXL is mega-huge (18 inch long blocks) and the tower can reach over 8 feet high. Guess what Jenga XXL would weigh if it was made from wood? Check them out on jenga.com! http://www.giantgamesofnyc.com has the largest selection of giant games I have ever seen.Even a 6 foot operations game. Well that just looks like a blast!